Getting in the mood for Thanksgiving and all the holidays? Stop at Oh Olive! 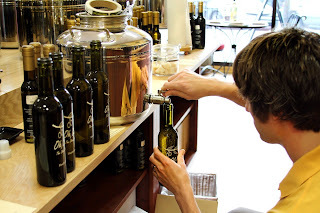 French Market and sample its delicious Wild Mushroom and Sage extra virgin olive oil. Oh Olive! suggests drizzling the Wild Mushroom and Sage extra virgin olive oil over turkey before roasting and using it to make delicious and unique rye bread turkey dressing. Oh Olive! chefs also suggest serving a side of Cinnamon Pear Sweet Potatoes. Recipes are available at Oh Olive! at the French Market. Enjoy a special 10 percent discount on shopping any Wednesday in November. Just say, "I love Oh Olive!" to get the discount.